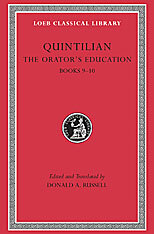 Quintilian, born in Spain about 35 CE, became a widely known and highly successful teacher of rhetoric in Rome. The Orator’s Education (Institutio Oratoria), a comprehensive training program in twelve books, draws on his own rich experience. 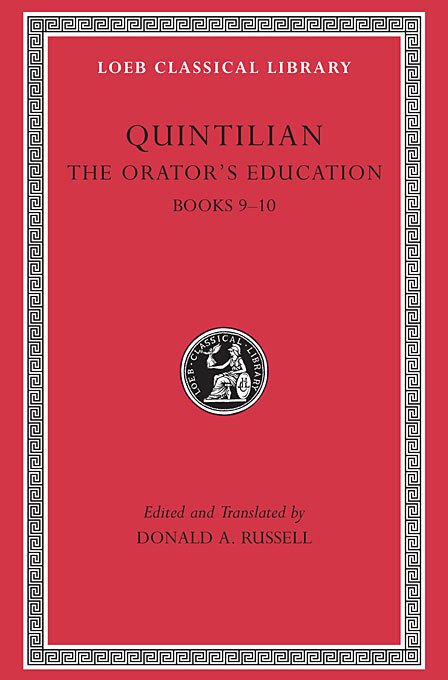 It is a work of enduring importance, not only for its insights on oratory, but for the picture it paints of education and social attitudes in the Roman world. Quintilian offers both general and specific advice. He gives guidelines for proper schooling (beginning with the young boy); analyzes the structure of speeches; recommends devices that will engage listeners and appeal to their emotions; reviews a wide range of Greek and Latin authors of use to the orator; and counsels on memory, delivery, and gestures. Donald A. Russell’s new five-volume Loeb Classical Library edition of The Orator’s Education, which replaces an eighty-year-old translation by H. E. Butler, provides a text and facing translation fully up to date in light of current scholarship and well tuned to today’s taste. Russell also provides unusually rich explanatory notes, which enable full appreciation of this central work in the history of rhetoric.